If someone collapses, they may be unconscious. An unconscious person may seem to be asleep. This may last for just a few seconds, when someone faints, or it may last longer. If a person stays unconscious for more than one minute, phone 111 and ask for an ambulance. If an unconscious person stops breathing phone 111 for an ambulance immediately. Then start CPR for adults and children or babies. Remember DRAB: Danger, Response, Airway, Breathing. Check for danger – things to look for include fire, electricity, and traffic. If it is safe, continue. If not, make it safe before going any further. Is the person responsive? Shout a question like "Can you hear me? ", or "Can you open your eyes?" and watch to see if there is any response. You can also gently shake their shoulders or ask them to squeeze your hand. DO NOT shake their shoulders if you suspect they have a back or neck injury. DO NOT shake a baby – if younger than 1 year, tickle or tap the soles of their feet, or rub their forehead. Check they can breathe. Lift their chin and tilt their head back to open their airway. DO NOT do this if you suspect they have a back injury. Follow the steps below instead. If something is blocking their airway and you can safely remove it, do so using your thumb and forefinger. If something is stuck, don't touch it as you may force it further into their airway. If it's stopping them from breathing, follow the advice for choking. Confirm they are breathing. Look for their chest rising and falling, feel their breath on your cheek, listen for the breathing. If they stop breathing begin CPR for children & adults or CPR for babies. keep them warm until medical help arrives. Leave the person in the position you found them, as long as they are breathing. If they're not breathing, start CPR, but DO NOT tilt their head back. Avoid bending or twisting their neck. 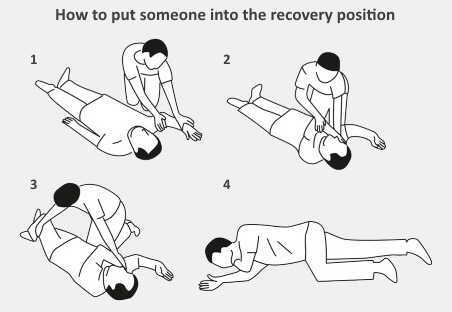 If the person vomits or is bleeding out of their mouth, roll their entire body on to the side, making sure you support their neck and keep their spine in a straight line. gently lift their jaw to open their airway. Patient.info – Dealing with someone who is unconscious, http://patient.info/health/dealing-with-someone-who-is-unconscious, retrieved July 2016. St John – Adult CPR, retrieved July 2016.